Each bucket supplies a solid Matt Black finish. It ensures heat from the fire or stove won't discolour the bucket's exterior easily. 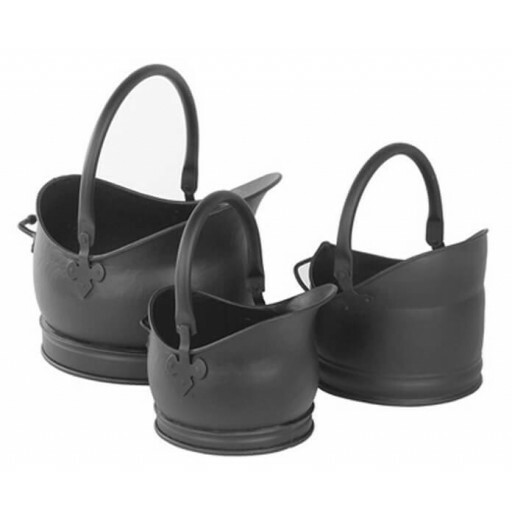 This delightful trio includes buckets with dimensions of 229mm, 254mm, and 330mm respectively to accommodate a variable supply of coal and other solid fuels. These sturdy containers include strong, high handles to help keep hands safely away from the flames when adding fuel to a roaring fire. The joint between each handle edge and the bucket interior forms a decorative fleur-de-lis union, with three strong rivet bolts in place to provide a secure joinder. You'll also notice the attractive broad rim along the base of each bucket. This feature helps ensure these carriers won't tip over easily when removing ashes. With care, this fine set should offer many years of utility and enjoyment!